Join Northwest Girlchoir in September! For girls and young women who love to sing, Northwest Girlchoir has openings for new singers entering grades 1-12 to join in the fun this fall. Learn musicianship, vocal technique, and performance skills, all while building lasting friendships in a supportive community. Grades 1-2: Easy online registration is now open for girls entering grades 1-2 to join Prep Choir! Enrollment for Prep Choir is open online until Friday, September 22. Members learn music in a fun and nurturing environment as they prepare for exciting mainstage concerts. Sign up online here. Grades 3-12: Fill out the Audition Request form by Monday, September 4 to join one of Northwest Girlchoir’s five progressive-level choirs this season! Auditioned choir members enjoy performing at mainstage concerts, in the community and at special events, and even on tours. Learn more here. Financial aid is available for every choir level and they encourage families to apply. Click here for more information, or call the office at (206) 527-2900. King County replaced the Fremont Siphon, a major sewer pipe running under the Ship Canal between Fremont and Queen Anne. The new siphon is located west of the existing siphon to reduce project risks and impacts to the community. Construction began in early 2015 and continued until spring 2017. The old siphon was decommissioned. You can check out more photos and videos from the ribbon cutting here. the Ballard Bridge) from 11am to 6pm. Admission is free. 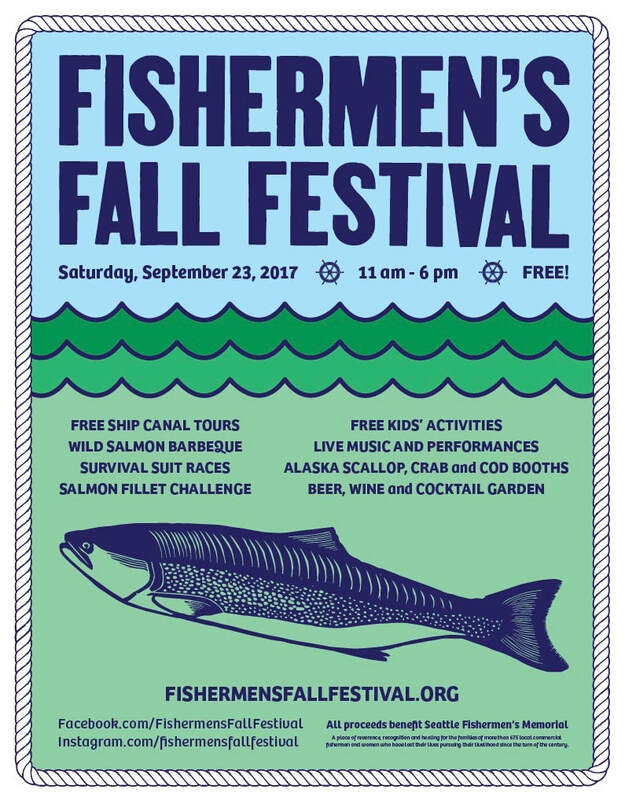 “The Festival celebrates the return of the North Pacific fishing fleet to the terminal, works to increase the public’s knowledge of the importance of the fishing industry as well as Fishermen’s Terminal to Seattle while raising money for the Seattle Fishermen’s Memorial Foundation,” the organizers tell My Ballard. The festival is a family-friendly event, with hands-on art projects with fishing themes, a wooden boat building and “Fishing for Fun” fish pond, live music and fishing information and demonstrations. Proceeds from the activities within the festival will be donated to the Seattle Fishermen’s Memorial Foundation to assist families of fishers lost at sea. The large lock at the Hiram M. Chittenden Locks in Ballard is now open to all marine traffic following repair of an unexpected hydraulics problem. Mechanics fixed a broken bolt and failed O ring, tested the hydraulic system and put the large lock back in service at 1 p.m. today. For current information about activities at the Locks, visit the Locks’ Web site at http://bit.ly/BallardLocks or follow the Locks on Facebook and Twitter: www.facebook.com/chittendenlocks<http://www.facebook.com/chittendenlocks> and http://twitter.com/ChittendenLocks. Brown Bear Car Wash celebrates its 60th anniversary next Thursday, August 24, by offering free “Beary Clean” car washes at 23 Puget Sound area tunnel wash locations from 8 a.m. to 8 p.m. The closest one to Magnolia is the location at 1800 15th Ave W.
Last year’s “Free Car Wash Day” set the all-time record as Brown Bear tunnel wash locations added sparkle and shine to 29,673 cars and trucks across the Puget Sound area. For the past ten years, family-owned Brown Bear has provided over 280,000 free washes as it celebrated its August “birthday” with customers and honored veterans and current service members on Veterans Day. “This is our way of saying ‘thank you’ to the community that has supported us for 60 years,” said Odermat. “It’s a fun and busy day as we celebrate with our customers while benefitting the environment.” During the anniversary celebration, on August 24 only, two customers will be selected to win free car washes for a year through Brown Bear’s Unlimited Wash Club. Customers can enter to win by taking a photo of your newly-washed vehicle and posting it on Twitter (@brownbear) or Instagram (@brownbearcarwash) with the hashtag #FreeCarWashDay. Widely recognized for its environmentally-friendly practices, Brown Bear uses gentle, biodegradable cleaning detergents at all its locations. For tunnel wash locations and more information about Brown Bear Car Wash, visit www.brownbear.com. Comments Off on Free car wash Thursday! Would you like a free toilet? Would you like to save money and the environment? Seattle Public Utilities Water Conservation Program can help you do both! Partnering with Sound Generations Minor Home Repair program, the Water Conservation Program will remove your old toilet and replace it with a water-saving toilet at no cost to you. To be eligible, you must receive a Seattle Public Utilities water bill, live in the home you own, have toilets that were installed before 2004 and meet income guidelines. Interested? Call Sound Generations at 206-448-5751 or click here to get started. Comments Off on Would you like a free toilet? With around 20 wildfires still blazing in British Columbia, the air quality burn ban has been reinstated for King County. It’s okay to use natural gas and propane grills, stoves, or inserts during a Stage 1 burn ban. · Ballard Branch<http://www.spl.org/locations/ballard-branch> – 5614 22nd Ave. N.W., 206-684-4089. · Beacon Hill Branch<http://www.spl.org/locations/beacon-hill-branch> – 2821 Beacon Ave. S., 206-684-4711. · Broadview Branch<http://www.spl.org/locations/broadview-branch> – 12755 Greenwood Ave. N., 206-684-7519. · Capitol Hill Branch<http://www.spl.org/locations/capitol-hill-branch> – 425 Harvard Ave. E., 206-684-4715. · Central Library<http://www.spl.org/locations/central-library> – 1000 Fourth Ave., 206-386-4636. · Delridge Branch<http://www.spl.org/locations/delridge-branch> – 5423 Delridge Way S.W., 206-733-9125. · Douglass-Truth Branch<http://www.spl.org/locations/douglass-truth-branch> – 2300 E. Yesler Way, 206-684-4704. · Greenwood Branch<http://www.spl.org/locations/greenwood-branch> – 8016 Greenwood Ave. N., 206-684-4086. · High Point Branch<http://www.spl.org/locations/high-point-branch> – 3411 S.W. Raymond St., 206-684-7454. · International District/Chinatown Branch<http://www.spl.org/locations/international-district–chinatown-branch> – 713 Eighth Ave. S., 206-386-1300. · Lake City Branch<http://www.spl.org/locations/lake-city-branch> – 12501 28th Ave. N.E., 206-684-7518. · Madrona-Sally Goldmark Branch<http://www.spl.org/locations/madrona-sally-goldmark-branch> – 1134 33rd Ave., 206-684-4705. · Magnolia Branch<http://www.spl.org/locations/magnolia-branch> – 2801 34th Ave. W., 206-386-4225. · Montlake Branch<http://www.spl.org/locations/montlake-branch> – 2401 24th Ave. E., 206-684-4720. · NewHolly Branch<http://www.spl.org/locations/newholly-branch> – 7058 32nd Ave. S., 206-386-1905. · Northgate Branch<http://www.spl.org/locations/northgate-branch> – 10548 Fifth Ave. N.E., 206-386-1980. · Rainier Beach Branch<http://www.spl.org/locations/rainier-beach-branch> – 9125 Rainier Ave. S., 206-386-1906. · South Park Branch<http://www.spl.org/locations/south-park-branch> – 8604 Eighth Ave. S., 206-615-1688. · Wallingford Branch<http://www.spl.org/locations/wallingford-branch> – 1501 N. 45th St., 206-684-4088. Visit www.spl.org/locations<http://www.spl.org/locations> for a map of all Library locations. For more information, call the Library at 206-386-4636 or Ask a Librarian<https://www.spl.org/using-the-library/get-help/ask-a-librarian>.